BC’s classrooms and school populations are evolving which includes a growing number of English Language Learners who are entitled to support. To aid Secondary Teacher Candidates in LLED 360, we worked with some instructors and their classes with some digital tools that will help ALL students, including ELLs. Afterward, we launched into Padlet to access TCs background knowledge on Digital Technologies and how they are currently being used in the classroom. This activity frames our conversations but also models how you can engage a Language Learner by giving them models to read, vocabulary to borrow, and time to think before providing an answer. Padlet allows the creator to curate responses (a.k.a posts) and then select what format to view them in – we used a Wall so everyone could post at the same time but then we transitioned it to a Stream so that we could read responses one at a time. We then looked at other features of Padlet and discussed how it specifically supports ALL learners in a classroom. Some alternatives to Padlet are lino, ryeboard, and corkboard. In Margaret Early’s section, she introduced REWORDIFY – an online application that allows users to enter text and simplify it. This is great for teachers to adapt text for their students so that they can access the content and recognize key content vocabulary. 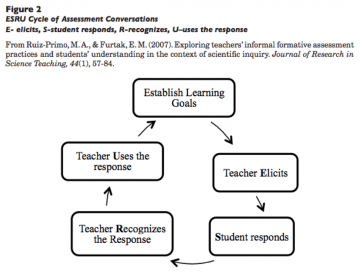 The second portion of her class focused on Student Response Systems (SRS) and specifically how using the ESRU model allows these digital tools to be used for formative assessment (read more on the ESRU model HERE). Margaret and I each led a session based on groups modeled after classroom stations. The SRS tools we tried out where Plickers and Socrative, The third option, but we ran out of time, was for TCs to self-teach themselves Kahoot or Quizalize. 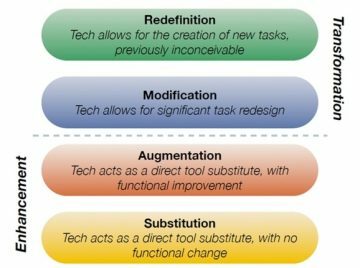 The big takeaway is that these tools don’t have to be used only for summative assessment at the end of a lesson. They can be used for a K/W/L (know, wonder, learned), as a temperature check to immediately find out who needs support or to change the direction of a lesson, or as an exit ticket to inform the teacher of what to review or spend more time on in the following lesson. We also had some great questions brought up in class regarding screen time and youth. After discussing with Yvonne, she recommended this resource from the Canadian Pediatric Society which discusses this concern. I’ve also included a Canadian Guidelines of Physical Activity because it includes recommendations for teens, not just young children. Teachers can also educate their own students about appropriate uses of technology and model the transformative creative aspects it provides. In Kyle Stooshnov’s section, we focussed on multi-modal student response using ‘WhiteBoard style applications’ including Explain Everything, Showme and Puppet Edu which are common apps in local districts. We took the time to ‘play’ with Showme since it’s a free option TCs could download. Using a Digital Whiteboard in a group allows TCs to practice their oral language as they worked together to accomplish a specific task. TC’s were challenged to use the ShowMe App to share how to make a paper airplane as a way to explore the benefits (and challenges) of using Digital Whiteboards. They were able to take photos, add text, draw their own arrows and if we had more time they would have also been able to narrate their presentations in-app. Lastly, we discussed the resources available on the Scarfe Digital Website. We appreciate all the feedback TCs provided so we can make changes and improve it. The slides below were used in Kyle’s class and include Digital Whiteboard resources which differ from the slides used in Margaret’s class. Another tool I mentioned but didn’t go into detail with was Backchannel Chat. This is an open platform where if a Teacher was providing a lesson, students could post questions throughout without needing to raise hands or feeling like they’re interrupting. It was a pleasure working with the group of soon to become Educators! If you’d like to explore anything related to teaching, learning and digital technology further, please be in touch or click the ‘Ask a Question’ link in this blog. Look for Eric in the foyer on Wednesdays or visit Janis or Yvonne in a drop in or workshop sometime this winter! Schedule here.